Though I call myself a gardener, I've recently found myself focusing more on pollinators than plants. It's hard to ignore the bugs in the garden, whether they're friend or foe. The more time I spend in the garden, the more I notice and enjoy the vast expanse of life that emanates from it. I've learned that I may not be able to get rid of unwanted wildlife, but with a little effort and attention, I can welcome beneficial garden friends. Pollinators are key to garden success and are a crucial part of our food chain. Without pollinators, our food supply would quickly dwindle. That's one reason that I want to do everything I can to support healthy eco-systems. I love flowers AND food. 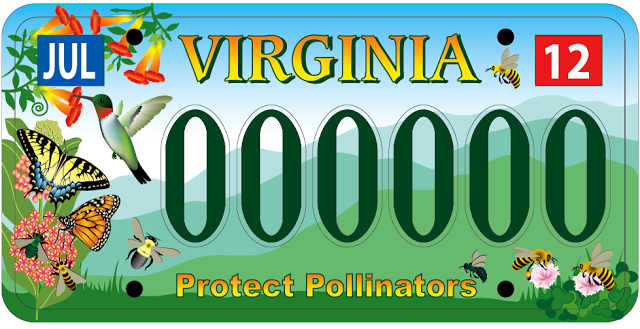 I'm very proud that drivers in my lovely state of Virginia can now pre-order pollinator license plates. The plates are beautiful, and they're designed to encourage pollinator awareness and conservation. Just look at them! Next time you're waiting in line at the DMV, think how cool you'll look with these pollinators adorning your car. For a little extra credit (since today is the first day of school), keep your plates clean and go for a bike ride in honor of the environment. 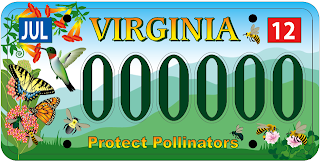 Hi- I was just looking online to see if any other states also have pollinator license plates, and I came across your blog post. Thank you so much! The bill is now beginning the process of going through the General Assembly this year. Very exciting! I hope when we get the plates, they'll get people talking and asking questions about pollinators and why we need to protect them.